Shad is one of the few fish to be loved more for its eggs, or roe, than for its meat. Keep in mind that I am talking about two specific species of shad here, the American shad, Alosa sapidissima, and the hickory shad, Alosa mediocris. While the meat of the American shad is indeed wonderful it has so many bones you need to know some tips and tricks for eating shad, or be a wizard with a fillet knife. The meat of a hickory shad is as its Latin name suggests: mediocre. Not so the roe of either species. If you have never eaten fish eggs, they are remarkably un-fishy for the innards of a fish, even of a giant herring like a shad. 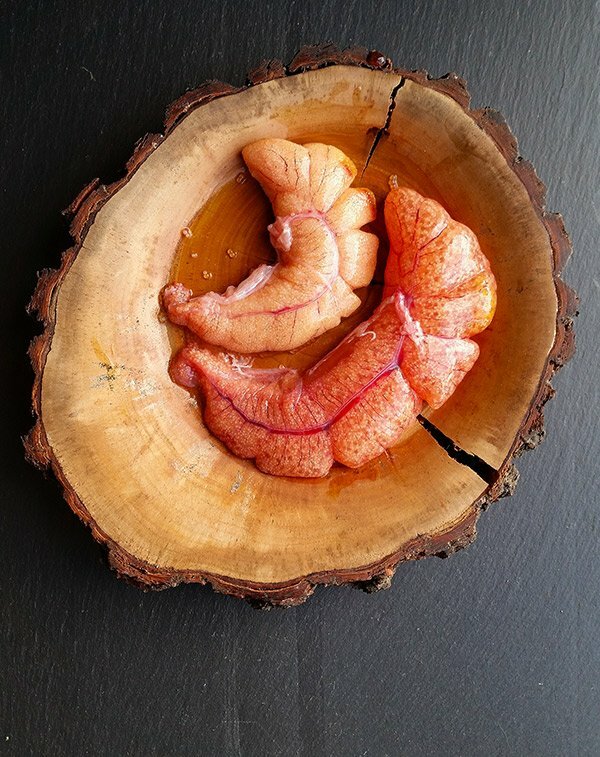 Perfectly fresh, they are light, almost fluffy and scrambled eggy, although firmer — indeed, shad roe is often broken up and served mixed with scrambled eggs; hot egg-on-egg action, this. Shad have been sought after for their roe for millennia. Native Americans enjoyed this fish, roe and all, and a similar species runs the rivers in Europe. Obviously only female fish have roe, usually two or three sacs. Males have milt, or “soft roe,” large white sperm sacs that are said to be creamy when cooked. I don’t know, as this is a line I choose not to cross. Roe in most fish is edible, with some notable exceptions like roe from a cabezon in the Pacific, or of the freshwater gar. A few roes, like that of the striped bass, just taste wretched. One of my favorite books ever written about fish, A. J. McClane’s The Encyclopedia of Fish Cookery, lists the following roes as edible and tasty: crabs, lobsters, sea urchins and scallops; herrings of all varieties, salmon, trout, flounders of all sorts, mullet, sturgeon, Pacific barracuda (not Atlantic barracuda), cod, haddock, flying fish, smelt, tuna, mackerel, paddlefish, lumpfish, carp, whitefish, cisco, tarpon, bonefish, weakfish and mahi mahi. I happen to know that yellow and white perch roes are wonderful, too, and I am certain there are plenty of other tasty roes out there. If you know of one, let me know in the comments section, OK? Shad roe, like most fish roe, is a springtime deal. you can get shad roe as early as late February from Florida, and as late as July from here in NorCal or in the Columbia River, where shad runs are late. Other roes have different seasons, and a few, like Great Lakes whitefish, are a late fall-early winter thing. If you are catching your fish, you need to know what a good roe looks like. Roe can be underripe, ripe or overripe. Underripe roe is obviously underdeveloped, small and dry(ish). Ripe roe just looks right, with decent sized sacs and developed eggs. Overripe roe is bloated and watery. In the image below, the roe on the left is perfect, the one on the right is overripe. Underripe roes are fine, and in some cases, like in salmon, are better cooked like shad than separated into caviar. Overripe roes are best salted down to make bottarga, a dry cured roe that is shaved onto pasta. It’s nice, if you like fishy things. How you cook them varies. For the most part, if the individual eggs are large, you make caviar out of them. I have a tutorial on how to make caviar here. With smaller eggs, like shad roe, you cook the whole sac. Some people par-cook them in broth or water before browning them. I have done this and it works, but you can very easily overcook a roe this way. My advice is to only par-cook roes that are thicker than about 1 1/2 inches. And when I say par-cook, I mean simmer very gently. Do not boil. Eggs have lots of moisture in them, so be prepared for minor explosions as you cook your roe in hot bacon fat or some other oil. Keep this to a minimum by cooking roe like bacon: Slowly, at a nice, calm sizzle. Dusting in some sort of flour is a must, as this dries the surface and allows the roe to brown better. What sort of flour is up to you. I’ve used both wheat and non-wheat flours with good success. I especially like chickpea flour for its color and flavor, so there’s a nice gluten-free option for those so inclined. 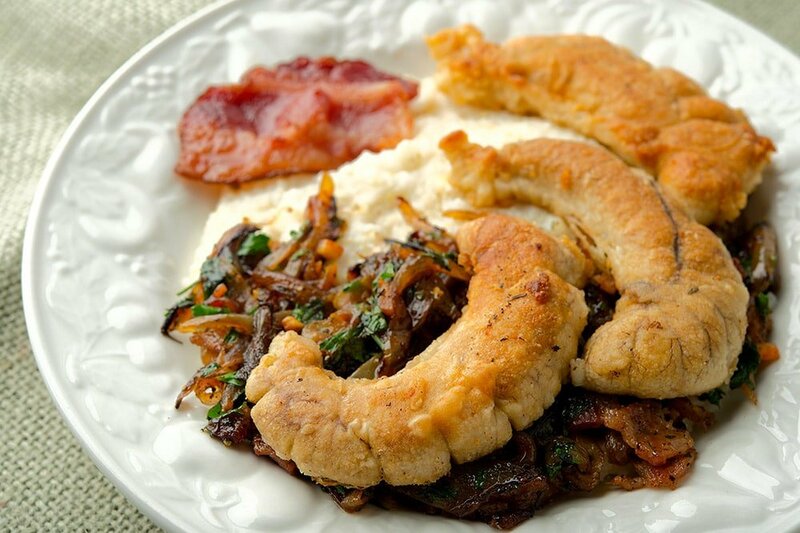 Shad roe and bacon is a classic combination I see no reason to mess with. 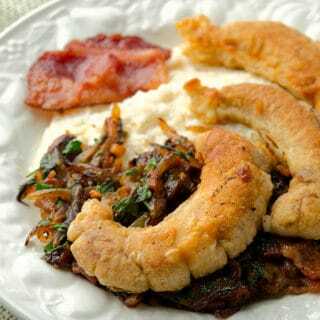 In Virginia, I used to eat obscene amounts of blueback herring and hickory shad roe with bacon and grits for breakfast every spring when the herring and shad were running. Now, apparently, the herring runs are too small to fish, which is sad. So you have salty, porky bacon. Firm-yet-fluffy roe. Grits are there for substance, and because they are a part of a Southerner’s balanced breakfast. You could do toast or whatever makes you happy. You need something herby and something tart to brighten it all up. Back in Virginia, my choice was always lemon and chervil, but here in NorCal, the chervil is long gone, so I go with parsley or even basil. Lemon is key, but limes, even grapefruit or vinegar are good alternatives. And if you make the caramelized onions in this recipe, a splash of Worcestershire in them will sub in for the lemon nicely. So. Next time you catch some fish and find roe inside, don’t toss it (unless you are gar or cabezon fishing). Give it a go, and I am betting you will be glad you did. While I normally make this with shad roe, any tasty roe will do. See above for a full list of alternatives. Note this this recipe needs to be done with fresh roe. Pre-frozen roe loses its texture and gets fishy. Remember, the keys here are bacon and its fat, some kind of flour for the roe, something herby and something acidic. If you remember that, you can play with this recipe depending on what you have on hand. Brine the shad roe first. Dissolve the salt in the cool water and submerge the roes in the brine for at least an hour, and up to 4 hours. The larger the roe sacs, the longer you will want to brine. I prefer 2 hours for shad, 1 for herring. About 45 minutes before you want to cook the roe, crisp the bacon slowly. Remove from the pan (eat a slice, you earned it), and set the bacon aside. Leave about 3 tablespoons of bacon fat in the pan to cook the onions. Caramelize the onions in the bacon fat by cooking them over medium-low heat for 20 to 35 minutes, stirring occasionally. About 15 minutes into this process, add the thyme, a pinch of salt, and the honey if you are using it. When the onions are about done, chop up some of the bacon and add it to the pan. While the onions are cooking, bring 4 cups of water to a boil in a pot, add a healthy pinch of salt, and sprinkle in the grits. Stir well to remove any lumps, then drop the heat to medium-low and cook the grits, stirring frequently, until they are smooth, about 20 minutes. Stir the unsalted butter into the grits and keep them warm. To finish the dish, either get another pan or set the onions aside and wipe out the existing pan. Remove the roes from the brine and dust in flour. Add at least 3 more tablespoons of bacon fat to the pan (add some butter or oil if you are short, but you shouldn't be), and brown the roes over medium heat. Normally this takes about 5 to 8 minutes total, and remember that it's better to have slightly underdone roe than roe that's been cooked to hell. 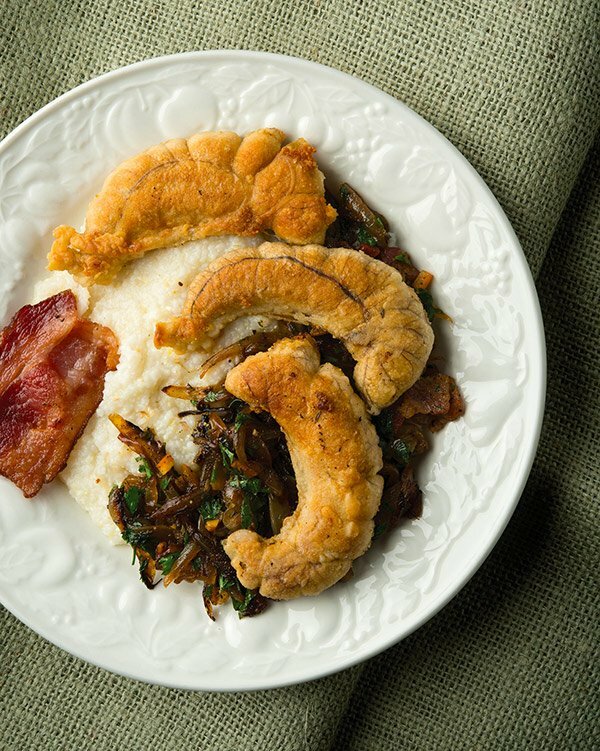 Serve everyone some grits, with a piece of bacon on the side. Add some lemon juice and the chopped parsley to the onions and put some on top of the grits, grind black pepper over everything and give everyone some roe. Lemon wedges on the side is a nice touch.